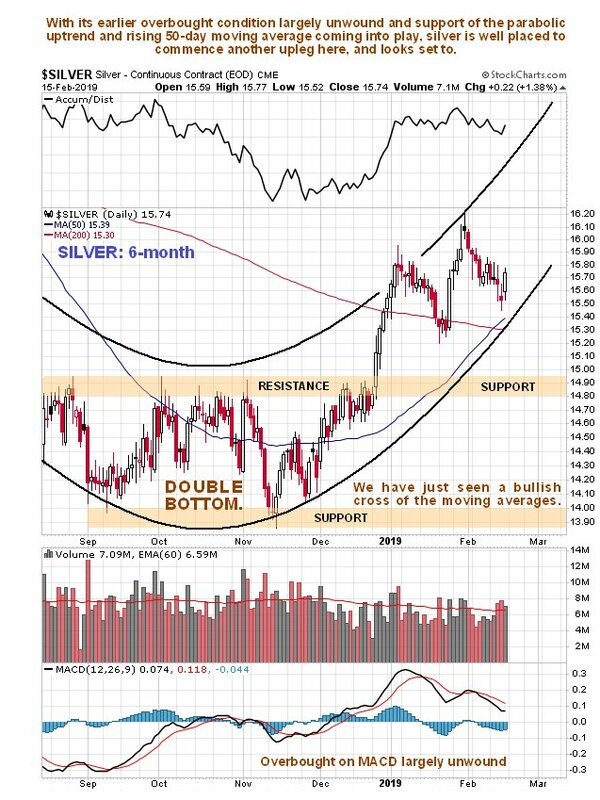 Home » Silver Market Update: Double Bottom on the 10-year chart.. The charts for silver look nowhere near as strong as those for gold, but that is normal for this stage in the cycle, as at the start of major sector bullmarkets investors tend to be cautious and conservative and favor gold over silver. Before going any further note that many of the observations made in the parallel Gold Market update, particularly regarding the dollar and Precious Metals stocks, apply equally to silver so there is no need to repeat them here, which is why the Silver Market update tends to be a lot shorter than the Gold Market update. 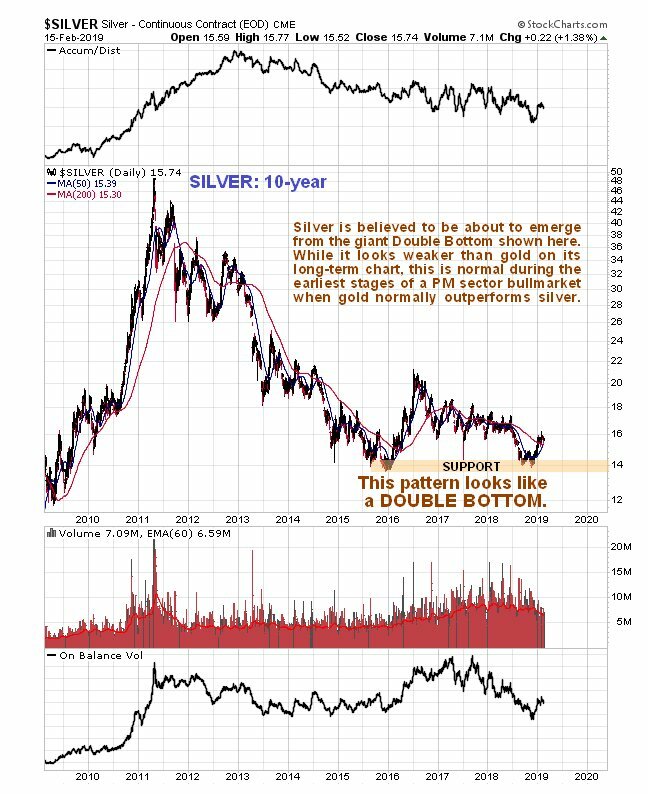 Starting with the 10-year chart we see that the giant base pattern in silver appears to be taking the form of a Double Bottom, instead of the complex Head-and-Shoulders bottom that we saw in gold. Silver certainly looks weaker than gold here and is still quite a long way from breaking out of its base pattern, and it will take a break above $22 to finally break clear out of it. The shorter-term 6-month chart looks more similar to that for gold with the same kind of parabolic slingshot move building. Within this curved uptrend it has tracked sideways since early January, which has allowed its earlier overbought condition to almost fully unwind and the rising 50-day moving average and parabolic uptrend to come into play, setting silver up for another upleg imminently, which is made more likely by the dollar looking set to drop soon, as we saw in the Gold Market update. We have just seen a bullish cross of the moving averages, which helps. As with gold, no recent COT charts are available due to the disruption caused by the US government shutdown. Finally, we are going to take a look at the silver relative to the broad stockmarket chart, as we did with gold. 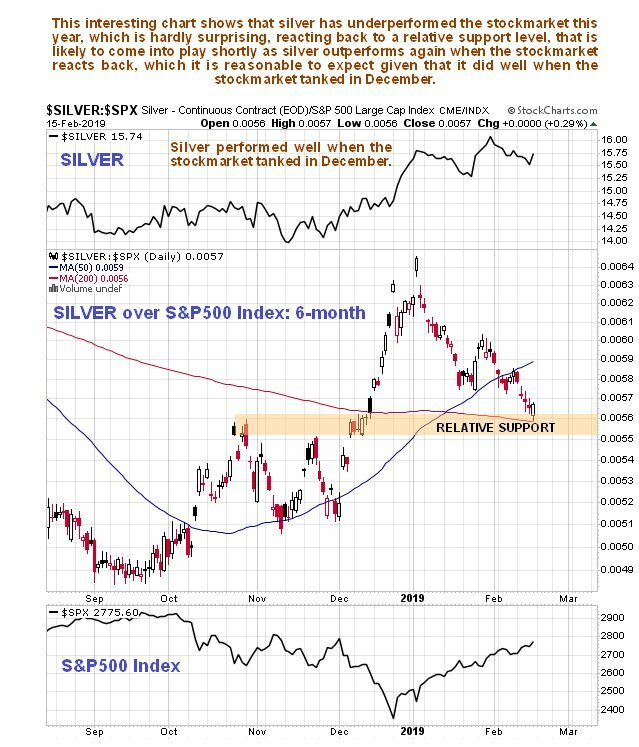 On a 6-month chart for silver over the S&P500 index, with silver at the top and the S&P500 index at the bottom, there are two very important observations to be made. The first is that silver performed well when the stockmarket tanked in December – this is important to know, because it means that if the market tanks again soon, silver will likely do well as a safe haven, unlike in 2008, which will probably be due to the dollar being weak at the same time. The 2nd key point to observe is that even though silver has held up well so far this year, it has still taken a back seat to the stockmarket, against which it has underperformed, resulting in a correction on its relative chart back to relative support, which again suggests that silver will shine if the stockmarket turns and drops hard, as in December.